Creating a proper horror game has become something rather divided over the last few years. Many horror titles in the West have either switched into an action style format where players will fight against the horrors in front of them or strip them of any ability to defend themselves, forcing them to only flee. There are very few titles that find a solid middle ground between simply leaving the player feeling helpless and actually providing terror and one series that has always been great in that regard is Corpse Party. So now that the conclusion to the Heavenly Host saga has been released in the West with Corpse Party: Blood Drive, how does the story wrap up? Although at the end of the last title it seemed that Heavenly Host Elementary School and its curse had finally been destroyed two months ago, the survivors have continued to suffer from the event. Their friends that lost their lives in that horrific place were never able to be saved and only those who survived even remember their names as their faces have been blackened in every picture and their entire existence seems to have been erased from everyone else’s memory, going so far as to completely replace their lost teacher as if nothing had ever happened. With the weight of the events hanging heavily on Ayumi’s mind, rumors that the deaths due to supernatural means in the world all lead to the curse of Heavenly Host leaking into the normal world, and this once again drives Ayumi and the other survivors to search for a way to return to the last place they ever would want to. Add in a number of new characters that have their own reasons for wanting to track down the school as well as the supernatural elements that it contains and you have a number of characters all trying to reach their own goal while faced with possible gruesome death. It is worth noting that Corpse Party: Blood Drive isn’t a title that will pull any punches and although it does take a bit to get going, once the story kicks into full gear players will be in for one hell of a ride. There is plenty of backstory given to both past events that players thought were finally finished as well as the new characters. Those expecting plenty of twists will also be pleasantly surprised as there are numerous events that take place that will keep players on their toes. It certainly helps that the writers’ ability to create a tense and horrific atmosphere hasn’t dulled in the slightest between Book of Shadows and Blood Drive as the sense of dread coming from the characters and the ghastly descriptions of the deaths that can occur if the player finds themselves either stumbling into a bad end or dying in the game are as terrifying as ever. Of course since the most exciting part of Corpse Party: Blood Drive’s storyline is the unknown, I won’t delve into any of the aforementioned twists or spoil any of the events that take place but this is certainly a game meant for fans of the series as there are numerous callbacks to past events that those who have never played the first two titles will be left with only the bare minimum of knowledge going off what the story wants to describe here, but those who have stuck around for the entire series are in for a very satisfying end if they dare venture into the halls of Heavenly Host one more time. 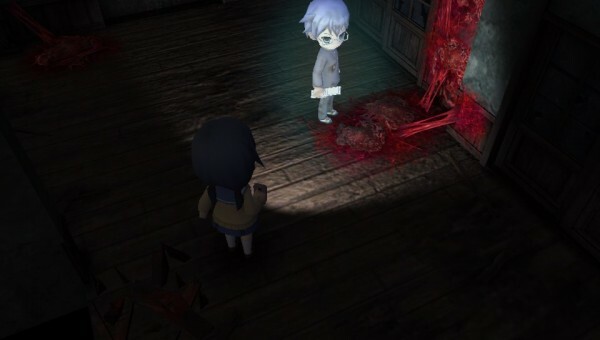 Corpse Party: Blood Drive made a jump to the PlayStation Vita with this release and with a bit more power the developers have tried out a different gameplay style by offering players 3D environments for the first time ever, since the original focused on 2D and the second title was more visual novel with exploration than anything else. Blood Drive harkens back to the original style of exploration as players will be spending the majority of the game split between the visual novel dialogue sequences and exploring the 3D environments. 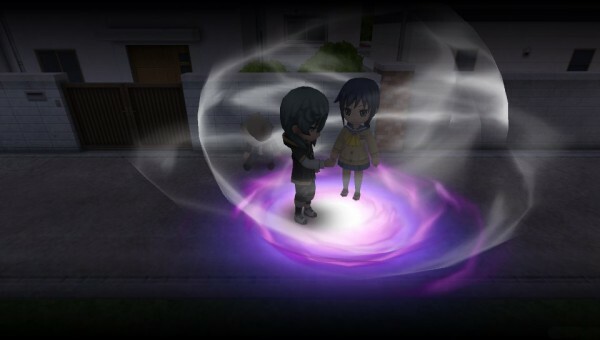 Unlike past games however, it seems that the darkness is far stronger in Corpse Party: Blood Drive as Heavenly Host now almost always requires players to make use of a flashlight to navigate its dangerous halls. With a limited supply of batteries available, players are encouraged to only use it when needed but thanks to numerous traps and pitfalls scattered throughout the halls and wires similar to the second game that can only be seen and disabled with the use of the flashlight players will find themselves moving gingerly through the halls as they keep a look out around them for traps while trying to keep their battery usage to a minimum. Traps aren’t the only danger to watch out for however as ghosts and phantoms that roam the halls must also be avoided as being caught by them will whittle away your health and potentially result in an early death. The best way to avoid these ghosts are to either sneak around them or, if seen, run as far as possible and try to hide out of sight in a cabinet. Since every character only has so much stamina to run and ends up coming to a stop when they run out of breath, another option is to use a talisman to dispel the ghost. Other than these dangers players will of course have to travel through the halls and classrooms of the school as they search for the areas that contain key items and the various puzzles that must be completed before advancing the story but here lies one of the main issues with the title. You see, while the game’s ten chapters and bonus chapters provide a lengthy experience for a horror game, a lot of this time will be spent looking at a loading screen. While it is certainly understandable to have loading sequences when traveling to another area or changing rooms, Corpse Party: Blood Drive makes the scariest thing the dark loading screen containing a ghost face as almost every aspect of the game requires at least seven seconds to load. This includes everything from opening the menu, navigating the inventory screen, changing options; to just swapping between rooms that should have loaded with the entire building considering scene transitions are the longest screens of all and completely ruin any of the tension the title may have been building up. 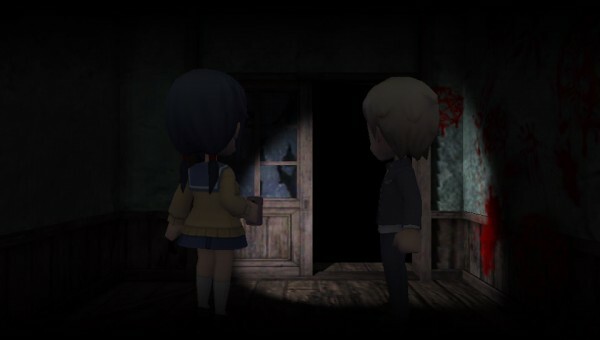 Now the change from to 3D character models does give Corpse Party: Blood Drive a refreshing appearance but it causes numerous frame rate issues with the game slowing down when enemies are on screen and it also detracts from the elements that past games were able to make players visualize for themselves. These almost chibi like characters lose some feeling of tension, with an early scene showing a girl stabbing herself in the hand with scissors simply resulting in a few spurts of blood that could have been far more gruesome if represented in any other fashion than the way it was chosen. This doesn’t mean all of the grisly horror and death has vanished from the game as there are still plenty of elements that pay off well through this system as well as numerous CGs and descriptions that are exactly what fans of this type of horror game are looking for. 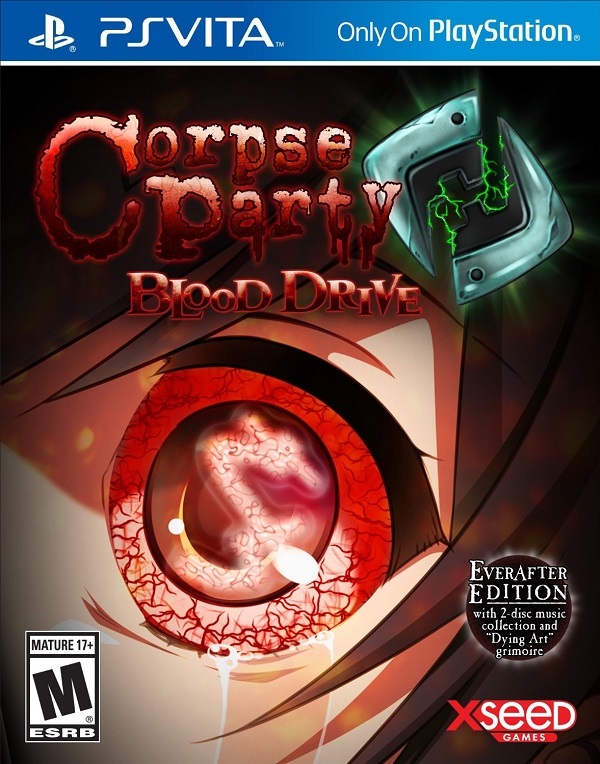 As before, Corpse Party: Blood Drive features only the original Japanese voice cast but this works for the benefit of the title as fans of the series are more than familiar with the characters at this point and the voice actors know how to portray the horror the characters are feeling very well. As for the background music and atmosphere of the game, I must recommend that players try to play this game with headphones or ear buds as the title is designed to make sounds appear like they are coming from various areas around the player to up the scary factor and it really does deliver here. 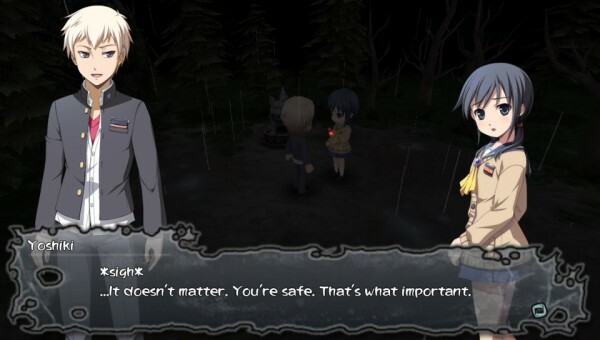 Corpse Party: Blood Drive delivers on where it matters most as it provides the continuation of the enthralling story that has kept fans on the edge of their seats ever since it was released. 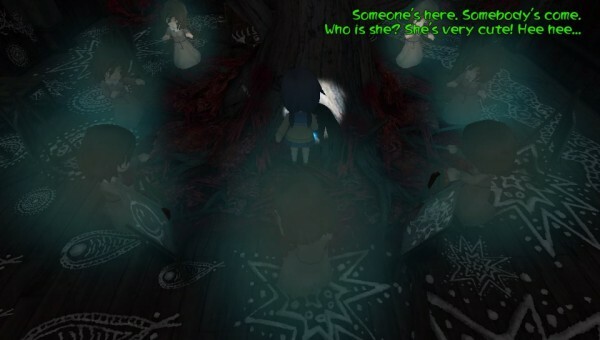 By expanding upon the lore of Heavenly Host and providing numerous twists to keep things bloody and exciting, fans will not be disappointed with what Corpse Party: Blood Drive has to offer, if only the technical issues didn’t make playing through said title to experience the story feel like such a drag.